The following article was written for Workers Vanguard by our comrades of the Spartacist League/Britain. Faced with a dramatic financial crisis that threatens to engulf other European countries, Ireland has been plunged into an economic nightmare. With Irish banks exposed to massive “toxic” debts, the Dublin government was compelled to negotiate a bailout that is somewhere in the region of 85 billion euros [$113 billion] from the European Union (EU) emergency bailout fund. Even before the terms of the bank rescue plan had been agreed by the European Central Bank and the International Monetary Fund (IMF), the Irish government announced a brutal austerity plan to cut £15 billion out of the (already slashed) budget. The National Recovery Plan drawn up by Fianna Fail party Taoiseach (prime minister) Brian Cowen amounts to the harshest attack on the living standards of the working people in the Irish state’s history. Backed by the Green Party, Cowen’s coalition partner, the plan includes the loss of an estimated 25,000 public sector jobs, vastly increased taxes and student fees as well as further cuts in welfare spending, public sector pay and a vindictive £1-per-hour reduction in the minimum wage. The budget is scheduled for approval by the Dail (parliament) in early December, followed by a general election in January 2011, if the government doesn’t fall before then. Nonetheless, Dublin’s ruthless budget did little to calm financial markets, and the massive sell-off of government debt continues, driving the government’s borrowing costs sky-high. Ireland’s crisis comes barely six months after the whopping £110 billion EU bailout of Greece; today, heavily indebted Portugal and Spain are already caught up in the panic hitting European financial markets, with countries such as Belgium also at high risk. Ireland’s bailout funds will serve to bolster its biggest creditors, which are primarily British banks. These include the Royal Bank of Scotland and Lloyds, both of which have already been bailed out by the British taxpayer and together stand exposed to some £80 billion [$125 billion] of Ireland’s debts. German and French banks are also exposed in Ireland. But the real concern is Spain, whose economy (not to mention deficit) is considerably larger than that of Greece, Ireland and Portugal combined and may be simply too big for the EU to rescue. If the crisis extends beyond Ireland, it will call into question the continued existence of the single European currency. Salvaging Europe’s banks is the primary aim of the imperialist bailouts of Ireland, Greece and any other country under consideration. 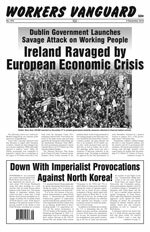 In Ireland, Britain and Europe as a whole, each government is determined to make the working masses pay for a crisis that is caused by the capitalist system itself. The austerity measures that governments are trying to ram through, including slashing the wages of public sector workers, gutting pensions and ramping up taxes, hit hardest at the poorest in society. In Ireland and elsewhere this includes immigrant workers. For Class Struggle Against Capitalist Austerity! The only way to fight these attacks is through hard class struggle. The Greek working class has already waged several one-day strikes this year against austerity. The French trade unions repeatedly brought the country to a halt—including blockading the oil refineries—during September and October in opposition to legislation to raise the pension age. And the Spanish and Portuguese trade unions have staged one-day general strikes against austerity measures. However, the effectiveness of the workers’ struggles has been hampered by the political bankruptcy of the workers’ reformist leadership, who accept the inevitability of capitalist austerity while seeking to soften the blows. What’s needed is the forging of a revolutionary leadership of the working class based on the understanding that there are no common interests between the proletariat and the capitalist bloodsuckers: workers must fight for what we need, not for what the bosses say they can afford. To the capitalist rulers who brought Ireland to the brink of bankruptcy, workers must say: To hell with the savage National Recovery Plan! But to unleash the social power of the organised working class and to forge a class-struggle leadership in the trade unions requires a political struggle against the reformist trade-union bureaucracy and Labour Party leaders who are committed to defending the interests of Irish capitalism. The servility of the trade-union bureaucrats was shown earlier this year when the leaders of Ireland’s main unions signed a deal with the government known as the Croke Park agreement, which effectively renounced class struggle against a previously announced round of budget cuts until 2014. One of the signatories, Jack O’Connor, leader of the Services Industrial Professional Technical Union, said there was no alternative. “Let’s assume we could win an industrial battle for a better deal—we’d still have to deal with the deficit,” he told the London Financial Times (23 May). The Croke Park agreement was the culmination of years of treacherous “partnership” agreements that kept workers’ wages low during the boom years in order to support the “Celtic Tiger” economy. There is no partnership between capital and labour, whose class interests are irreconcilably counterposed! to solve the capitalist crisis. One of the country’s largest trade unions, the Technical Engineering and Electrical Union, is calling for a campaign of civil disobedience “if the government does not hold a general election.” Tailing Labour and the trade-union leaders, reformist left groups are also angling for a general election. The Socialist Party’s Member of the European Parliament, Joe Higgins, announced that his party will team up with remains of the Socialist Workers Party (SWP) to form the United Left Alliance (ULA). Higgins is joined by Richard Boyd-Barrett, a local councillor elected on the SWP-led “People Before Profit Alliance” ticket. Lest anyone think the ULA represents a challenge to the Irish capitalist order, Boyd-Barrett assured the Irish Times (26 November) that the alliance will be based on “simple principles of solidarity and people power” and was not “talking about extremism.” The SWP is so mired in the ideology of the “death of communism” that even the cravenly reformist Socialist Party complains that the SWP argued that “socialist policies would put people off from voting for candidates or from getting involved in a left alliance” (socialistparty.net, 11 November). As for the Socialist Party’s version of “socialism,” it amounts to nothing but old-fashioned Labour reformism, encapsulated today in the call for nationalisation of the banks (coupled with “end the bailouts”). Leaving aside that the banks are either already nationalised, partly nationalised or on the verge of nationalisation, this is hardly a “socialist” measure but simply a scheme for trying to ameliorate the capitalist crisis. Far from offering a challenge to Ireland’s clericalist capitalist state, the ULA will amount to an auxiliary to the Labour Party. A general election would almost certainly result in a coalition government of the bourgeois Fine Gael and the Labour Party. Indeed, the Labour Party is currently seen as the party which will win the votes of workers who traditionally have voted Fianna Fail. Currently polling at 27 per cent, compared to its usual 10-12 per cent, Labour’s potential role in the next government would be particularly useful to the capitalist class. Promising “to give the people the leadership required to turn this country around, rebuild the economy and restore national morale,” Labour is best placed of all the parties to try to convince the working class to knuckle down and accept austerity. In Ireland, “left” governments take the form of “popular fronts”—i.e., coalitions between the reformist Labour Party and outright representatives of the bourgeoisie. Revolutionaries are unconditionally opposed to these alliances, which chain the workers to the capitalist class enemy. Likewise, we are opposed to voting for bourgeois parties, including the Sinn Féin nationalists and the Green Party. Sinn Féin is itself seeking to capitalise on the decline of Fianna Fail. Sinn Féin leader Gerry Adams, a longtime leader of the party in [Protestant-dominated] Northern Ireland, plans to contest a Dail seat south of the border. Sinn Féin’s Martin McGuinness occupies the deputy First Minister’s post in the Northern Ireland Assembly, where his party has shown its loyalty to the sectarian Orange state, including to its police force which is notorious for brutal subjugation of the oppressed Catholics. The British Army has retained a garrison of several thousand troops who can be called upon instantly to provide “assistance” to the Police Service of Northern Ireland/Royal Ulster Constabulary. We demand: All British troops and bases out of Northern Ireland now! Sinn Féin’s support for state repression against dissident Irish Republicans in the North ought to go down well in the Dublin government, which has been committed to repression of Republicans since the foundation of the Irish Republic in 1921-22. Sinn Féin shares Fianna Fail’s commitment to Catholic nationalism, which is viciously anti-woman, anti-Traveller [Gypsy] and anti-working-class. Sinn Féin has produced its own plan for economic recovery, promising to cut spending. This is further proof of Sinn Féin’s commitment to serve the bankers and bosses and their capitalist system, which is ruining the lives of the working class. According to Irish economist Morgan Kelly, as many as 100,000 mortgage holders will default on their payments in the coming period. “People are going to extraordinary lengths—not paying other bills and borrowing heavily from their parents—to meet mortgage repayments, both out of fear of losing their homes and to avoid the stigma of admitting that they are broke,” said Kelly (Irish Times, 8 November). He noted that the presence of a permanent team of European Central Bank “observers” in Dublin’s Department of Finance (known collectively as “The Germans”) has led to a nationalist hue and cry over Ireland’s “sovereignty” being surrendered to the EU. British prime minister Cameron tried to assuage his backbenchers by claiming that the £7 billion his government made available to Ireland is merely help for “a friend in need.” Not quite: Britain’s capitalist rulers are offering a loan to Ireland which, if accepted, will have to be repaid. This is what the British government is today demanding of Iceland, which received such a loan made when its banking system tanked in 2008 and the economy was thrown into recession. At the time, Britain’s Labour government offered a loan not out of generosity but because Icelandic banks held huge funds belonging to British investors, including local councils. Cameron’s motivation in regard to Ireland is not unconnected to the fact that the British economy is in the doldrums and Britain’s trade with Ireland exceeds that with China, India, Brazil and Russia put together. The working class must understand that the capitalist system itself can and must be overthrown by workers revolution. A revolutionary leadership would fight for a series of transitional demands linking the struggle against the current attacks on the working class and the poor to an understanding of the need for proletarian socialist revolution. Faced with mass unemployment, a class-struggle leadership in the unions would demand sharing the work among all workers, with no loss in pay. Against job insecurity, it is necessary to eliminate the differences between workers on temporary and permanent contracts, requiring a fight to organise the unorganised. In the interests of women, who are especially oppressed in the Irish clericalist capitalist state, we call for free abortion on demand and for free, quality, 24-hour childcare. Against the divide-and-rule racism of the bourgeois state, we demand full citizenship rights for all immigrants! We are implacably opposed to the EU, an imperialist trade bloc within which the major European imperialists co-operate against the working class and immigrants, as well as against their imperialist rivals in the U.S. and Japan. Within the EU, Germany, France and Britain dominate the poorer member states. The “second tier” includes East European countries that were devastated by capitalist counterrevolution, which also destroyed the Soviet Union in 1991-92. Today East Europe is used as a source of cheap labour, raw materials and markets by the big powers within the EU. The single European currency has enabled German imperialism to increase its competitive edge over other countries in the euro zone. But the single currency, and the EU itself, are inherently unstable entities, subject to the conflicting national interests of Europe’s capitalist governments. Our proletarian-internationalist opposition to the EU is counterposed to reactionary “Euroscepticism” and national chauvinism, which is poison to class struggle, serving to pit workers against each other along national lines and reinforcing racism. Ireland’s extraordinary growth rate during the Celtic Tiger years was based on extremely low corporate taxes, a construction boom and a housing market bubble. U.S. corporations have taken advantage not only of Ireland’s 12.5 per cent corporate tax rate but also of a scam known as the “Double Irish.” This is not a large Jameson but a method of escaping even the low tax rate by shuttling profits into and out of Irish subsidiaries, as allowed by Irish law. This particular tax dodge is favoured by Facebook and Google. Ireland’s working people have now fallen victim to the boom-bust cycle that is inevitable under capitalism. What must be understood is that the only way out of this cycle is through the workers in Ireland—North and South—joining with the multiethnic proletariat in Britain, which has a large Irish component, in the overthrow of the capitalist order throughout these islands. The working class in Britain, which is currently facing an enormous attack at the hands of the Tory-Liberal Democrat government’s budget cuts, must wage class struggle to defend its own interests and forge a new, revolutionary leadership in opposition to Labour reformism. As proletarian internationalists, we vehemently oppose nationalist protectionism and anti-Irish chauvinism, as virulently expressed in the demand “British jobs for British workers.” Our programme for a workers republic in Ireland, part of a voluntary federation of workers republics in the British Isles, is based on the understanding that the fate of the working classes on these islands is indissolubly linked. Socialist revolution will sweep away the reactionary “United Kingdom,” the Orange statelet in Northern Ireland which is inherently oppressive of the Catholic minority, and the Catholic clericalist state in the South. Our task is to build Leninist-Trotskyist parties dedicated to the fight for socialist revolution on both sides of the Irish border and both sides of the Irish Sea—an essential part of the struggle for a Socialist United States of Europe. Down With Imperialist Provocations Against North Korea! All Imperialist Occupiers Out Now!